This time it’s personal for Sherlock and Savich in Paradox, the latest book in the FBI Thriller series. Sherlock and Savich awake to an attempted kidnapping of their five-year-old son, Sean. Concurrently, Chief Ty witnesses a murder on a lake. When the lake is dragged for the victim, many old bones are found along with the new body. A old belt buckle is found with the victims that links the case to another in Sherlock and Savich’s history. The three stories intertwine as the plot plays out. Regardless of which series I’m reading, Catherine Coulter never fails to keep me entertained. Even in the 22nd book in this series, the suspense is kept at a fever pace. 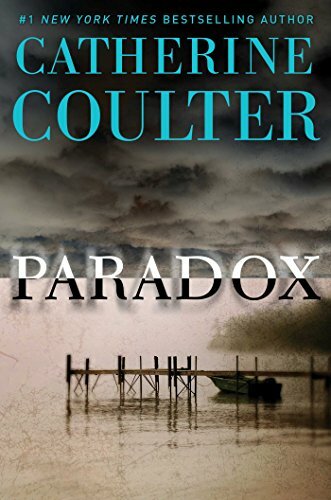 Paradox begins with a breathless adrenaline rush and finishes with a twisty but not ultimately surprising finale. I liked Enigma, the immediately prior book in the series, more (review here) than this one but that was because of the science in that book. Still this book is highly recommended for thriller fans. 4 stars! Thanks to the publisher, Gallery Books, and NetGalley for an advanced copy.